The word of the week: tardy but nonetheless worthwhile, provided you plan on trolling for unnerving arachnids in the planet’s tropical and subtropical regions. vinegeroon (vin-ə-gə-ROON) — noun: a member of the arachnid order Thelyphonida, known for its whiplike tail and ability to emit a vinegar-like odor when attacked. 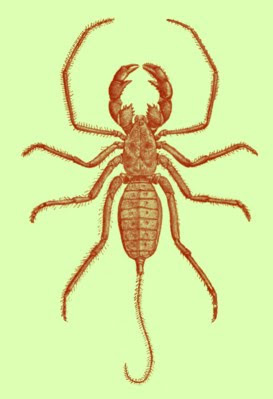 The species previously belonged to the apparently now-defunct order Uropygi, the name of which survives today in an alternate name of the species uropygid, which literally means “tail rump.” They’re not actual scorpions and they’re not poisonous. And despite their propensity for excreting their foul-smelling substance, some people apparently keep them as pets, as this website suggests. Some even let them closer to their person than most of us would be comfortable with. Which is fine for some, but I would rather keep looking for the vinegar cookies. Isn't "tail rump" redundant? Or is it, on a big rump, the very most tail-ish part? Possibly, depending on how you use them. Dogs sit on their rumps but wag their tails. Humans have rumps but generally do not have tails. I think "tail rump" here results from an effort to name the two most significant parts of the animal, which are especially noticable in photos: the little tail and the but, which, I must say, is comically large for an arachnid. I had a vinegaroon for two years! I won him in a "count the cockroaches" contest on petbugs.com back in 2001 or so. His name was Rapelje. He hardly ever squirted vinegar except on long plane rides. I liked watching his long front arms waving about, conducting the music of the spheres.